WASHINGTON: US President Donald Trump on Twitter praised Western air strikes against the Syrian government on Saturday (Apr 14) as “perfectly executed”, and added “Mission Accomplished”. “A perfectly executed strike last night. Thank you to France and the United Kingdom for their wisdom and the power of their fine Military. Could not have had a better result. Mission Accomplished!” Trump said in a Twitter post. US, British and French forces struck Syria with more than 100 missiles on Saturday in the first coordinated Western strikes against the Damascus government, targetting what they called chemical weapons sites in retaliation for a poison gas attack. US President Donald Trump announced the military action from the White House, saying the three allies had “marshalled their righteous power against barbarism and brutality”. British Prime Minister Theresa May described the strike as “limited and targeted”, with no intention of toppling Assad or intervening more widely in the war. She said she had authorised British action after intelligence showed Assad’s government was to blame for gassing the Damascus suburb of Douma a week ago. In a speech she gave a vivid description of the victims of the chemical strike that killed scores, huddling in basements as gas rained down. She said Russia had thwarted diplomatic efforts to halt Assad’s use of poison gas, leaving no option but force. French President Emmanuel Macron said the strikes had been limited so far to Syria’s chemical weapons facilities. Paris released a dossier which it said showed Damascus was to blame for the poison gas attack on Douma, the last town holding out in a rebel-held swathe of territory near Damascus which government forces have recaptured in this year’s biggest offensive. US Defence Secretary Jim Mattis called the strikes a “one time shot”, although Trump raised the prospect of further strikes if Assad’s government again used chemical weapons. 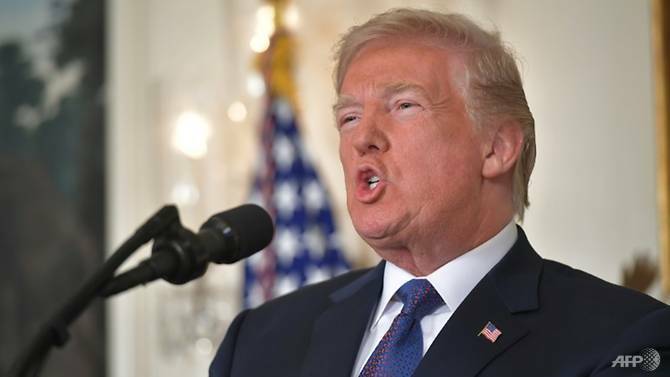 “We are prepared to sustain this response until the Syrian regime stops its use of prohibited chemical agents,” the US president said in a televised address. Russian President Vladimir Putin called for a meeting of the UN Security Council to discuss what Moscow decried as an unjustified attack on a sovereign state. Diplomats said the meeting would take place in New York at 1500 GMT (11pm Singapore time).